This was the second leg of my annual solo hiking trip to Utah. I spent the last few days in Salt Lake City and then hit the road for the gorgeous four-hour drive from Salt Lake City to Moab. 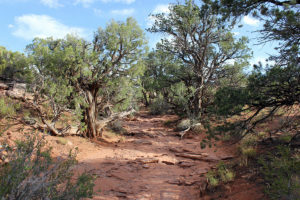 It was a beautiful change of scenery navigating from the damp, cool mountains of northern Utah to the red dirt and dry desert of southern Utah. 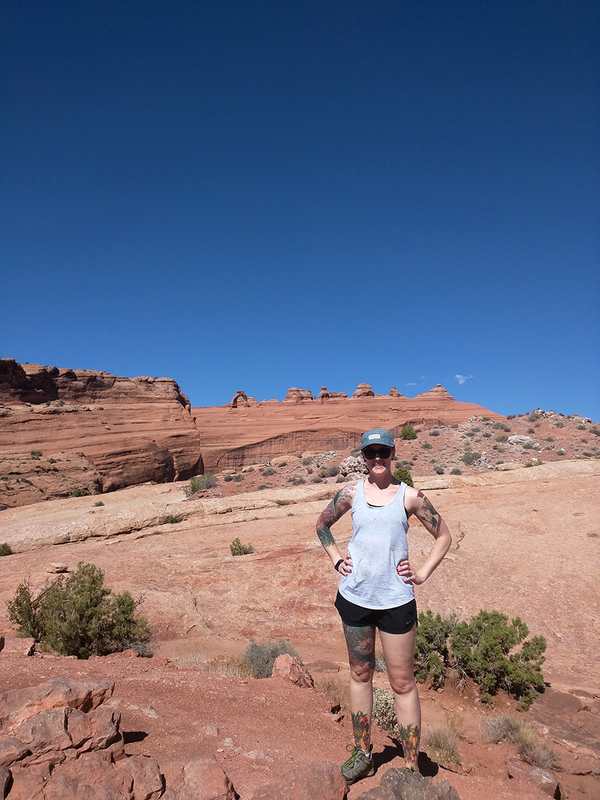 I arrived in Moab early on a Sunday afternoon and had some time to kill before I was able to check into my Drew’s San Miguel Wellness AirBNB. Drew was a lovely host and I had such a nice time staying at this little home. It was separate from their main house, and seemed almost brand new. It was cozy and had every comfort I needed. 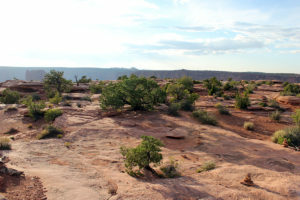 It was the perfect basecamp for resting up each night and starting out each day to hike in the Moab desert. He very kindly provided homemade muffins, plus fresh fruit, yogurt, tea and coffee to make my mornings healthy and easy. He also had laundry machines which was a total game changer for me after a weeklong hiking trip! The house is in a small, quiet neighborhood and I got the most wonderful, silent nights of sleep while I was there after doing six to eight miles on my feet each day. 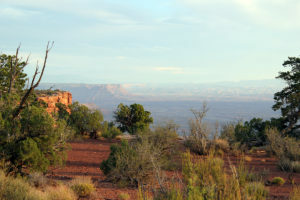 Right away upon arriving in Moab, I went to a restaurant that came highly recommended from friends, ratings and reviews. 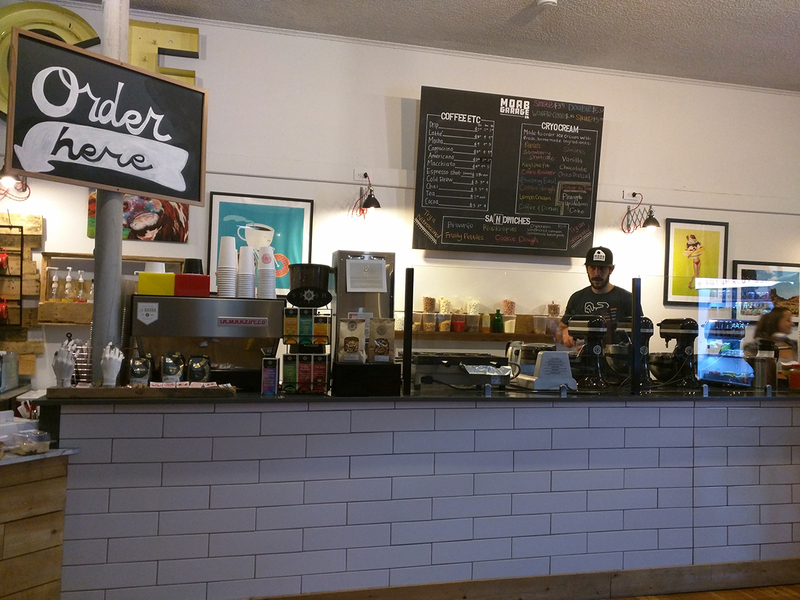 I checked out Eklecticafe on the main drag in town. 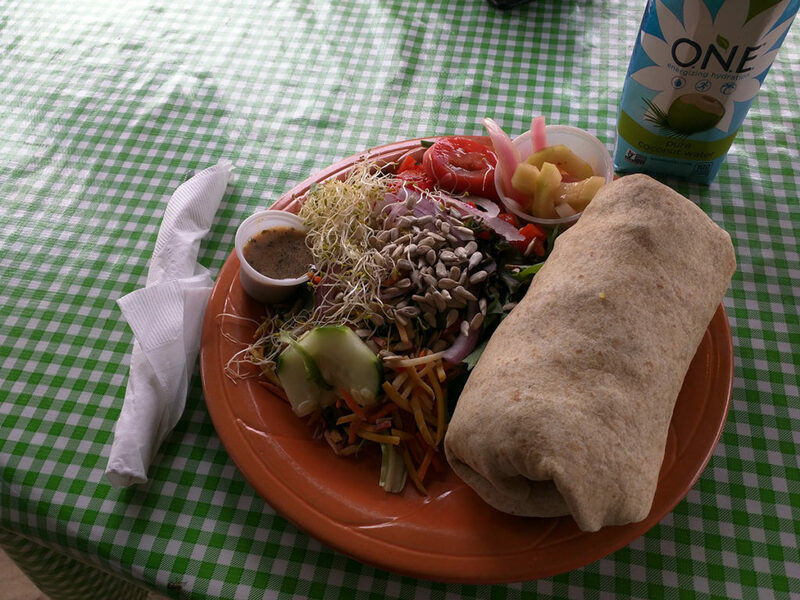 I got their hefty curried basmati rice rap with tofu, a deliciously spicy Thai cucumber relish, and an exciting little side salad. I enjoyed this lunch alongside a coconut water and my book on their patio so I could people watch people meandering downtown. 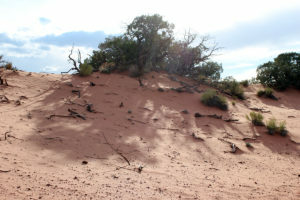 I was eager to check into my AirBNB so I could hit the road and start hiking around Moab as soon as possible. 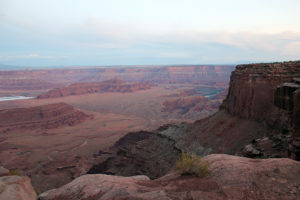 I made the drive out to Dead Horse Point State Park, which was an easy 40-minute drive from Moab, and on the same route as going to Canyonlands National Park. 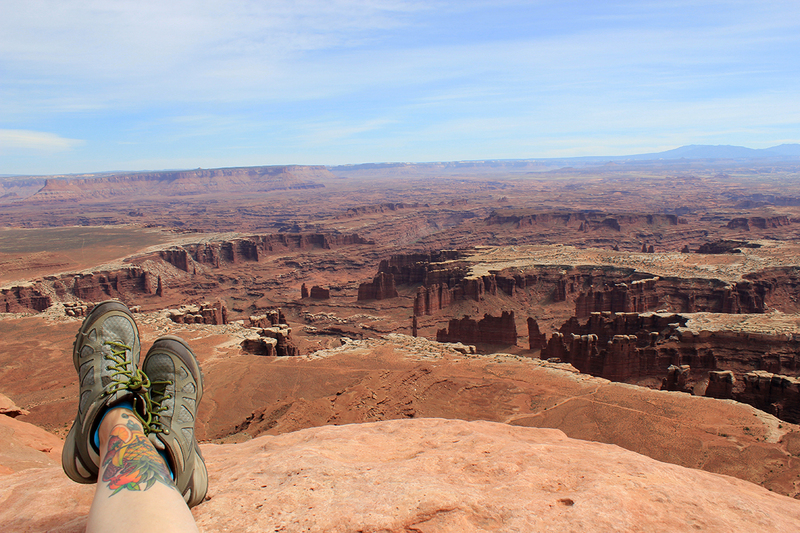 I made it to Dead Horse Point at around 5:00 p.m.
After all my mountain hiking in Salt Lake City, my sore legs appreciated the easier, flatter terrain. I spent a lot of my childhood in Albuquerque, New Mexico, so I have nostalgic feelings that bring me back to living in the desert every time I hear the crunch of the high desert mesa top under my hiking shoes. 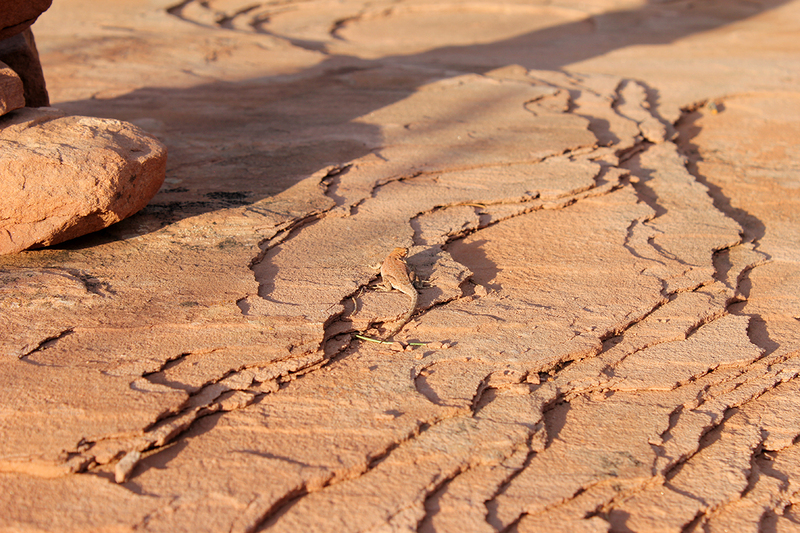 I love the feel of the hard, smooth slickrock under my feet too. 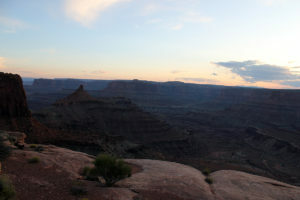 There are about seven miles of trails around Dead Horse Point, and I managed to hit about half of the mileage this late in the evening. 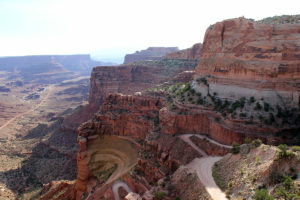 Just steps from the visitors center was an impressive canyon view overlooking the Colorado River to kick off the walks. 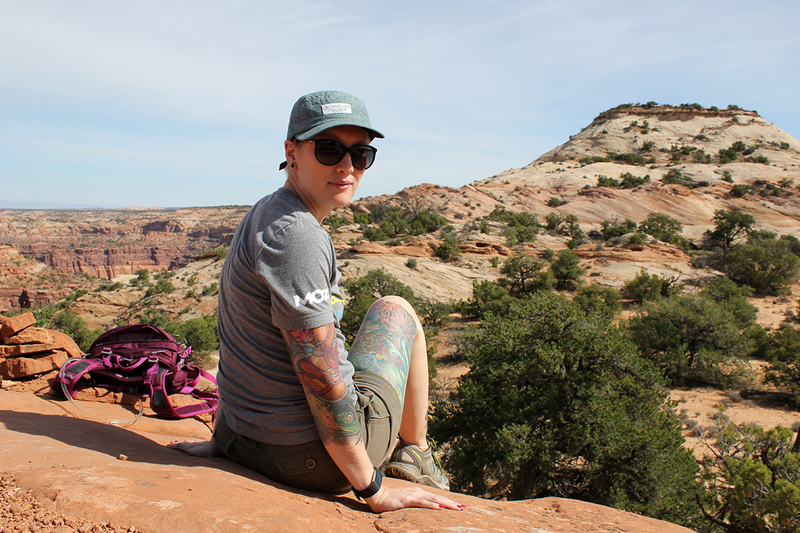 It felt like I had the park to myself most of the time until I left between 7:30 and 8:00 p.m. After just a mile here or half a mile there, I would be faced with more and more stunning sandstone cliffs and beautiful canyon views. As the sun started to set in the distance, I had to just stop and inhale deeply to fully take in the beautiful scenery around me. 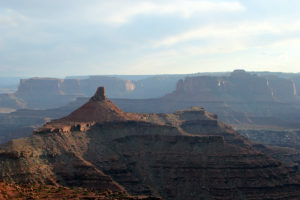 Dead Horse Point State Park would prove to be one of my favorite things I did while in the Moab area. Heads up – the drive back to Moab is very, very dark as there are no street lights on the road back to the main highway. 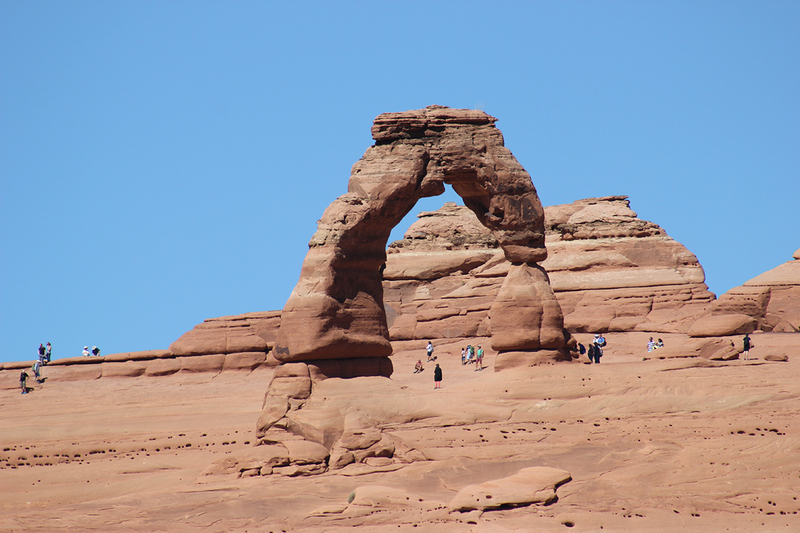 On day two, my mission was to see as much of Arches National Park as humanly possible in one day. 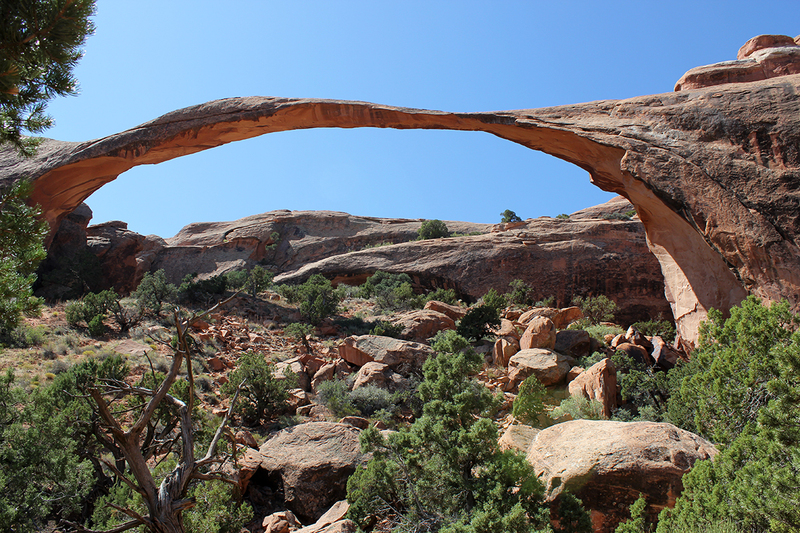 It’s not unreasonable to cover the length of Arches National Park in one day if you have the endurance. 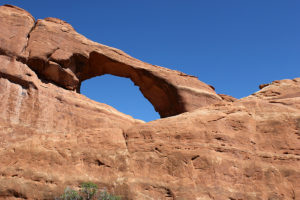 One important note is that there are key parts of Arches National Park under construction right now, so some popular spots like Balanced Rock were completely closed off to the public. Operating hours were also more limited with the park firmly closing at 7 p.m. each night. I don’t know if those factors contributed to the long wait to get in the gate at 9 a.m., but I sat in a line that shouldn’t have taken that long to process for almost an hour, so that was frustrating. But when I did finally make it to the front, I decided to invest in the annual national park pass (good for two people) for $89, which gets me into all national parks for a full year. 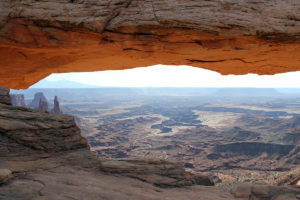 This includes nearby Canyonlands National Park the following day. Once I was through the gate, though, all my frustrations with the line melted away as I drove to the far end of the park to work my way back. I tried to cover as much round as possible by sticking to the easier hikes with narrow cliff edges. 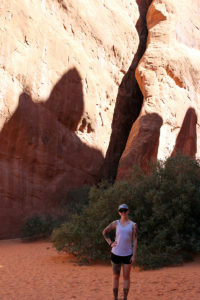 The red rock formations and desert sand of Arches National Park were truly beautiful to witness up close and personal. I drove through the full 18-mile length of the park as soon as I got there to get the lay of the land. 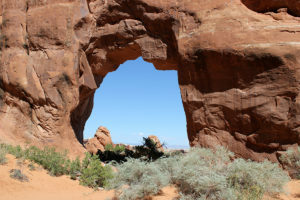 I decided to drive to the end at Devil’s Garden and work my way back toward the main entrance from there. I wasn’t the only person with this idea, so it was definitely crowded and tough to park at the first spot. It got easier from there, though. 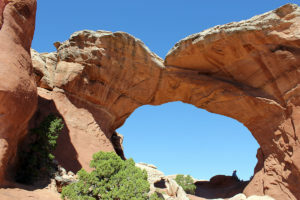 There I saw Dark Angel and Double O Arch, Pine Tree and Tunnel Arches. 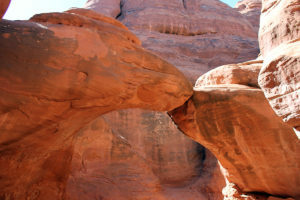 After that I headed to Fiery Furnace, then the upper and lower Delicate Arch viewpoints and Panorama Point. 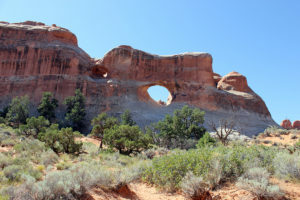 I visited the Windows section of the park to see Double Arch and the North Window and South Window arches. 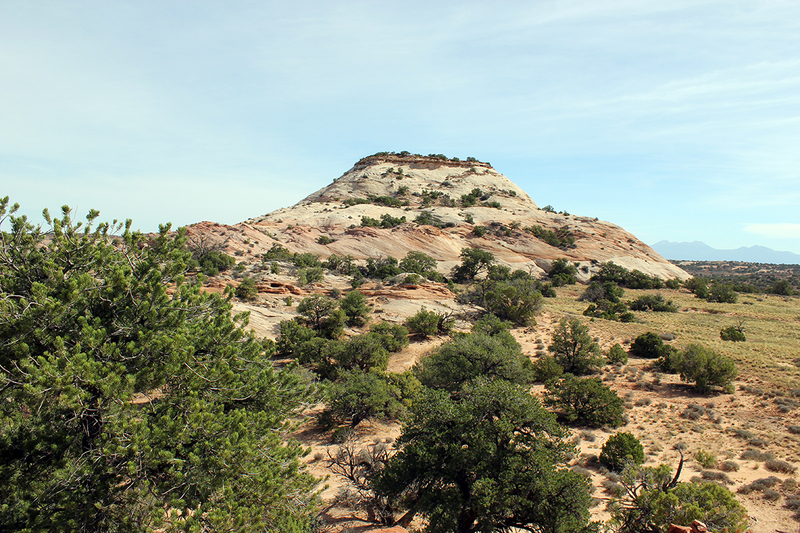 I continued down past the Rock Wall and Pinnacles to enjoy the Petrified Dunes Viewpoint. 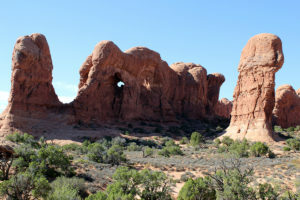 From there, I drove through the beautiful and varied Courthouse Towers area to appreciate the particularly unique rock formations it had to offer. 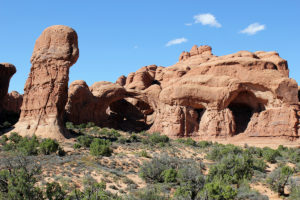 I loved the Three Gossips, Sheep Rock, Tower of Babel, The Organ – it’s cool to see these famous spots you’ve seen in pictures come to life in front of your eyes as you pass from one behemoth formation to the next. There are many outlook points and pull-offs through the length of the park, and I stopped at nearly all the major ones to look around. 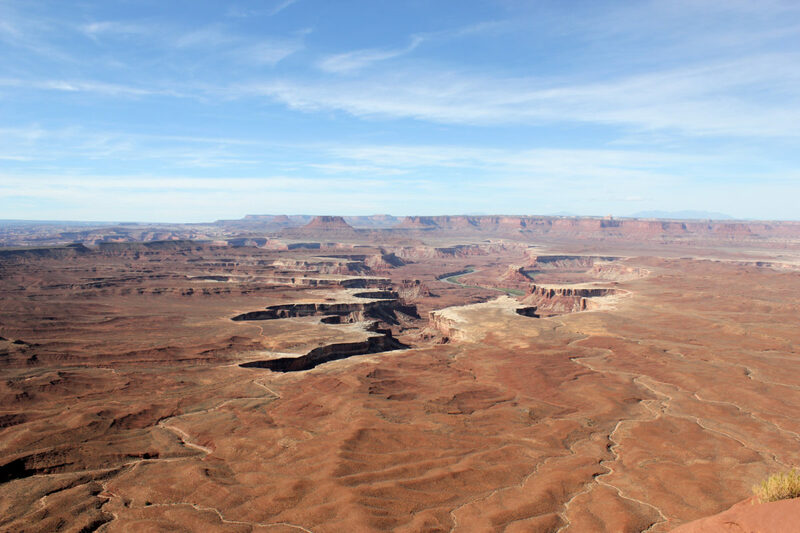 There are remarkable panoramic views that no camera could ever do justice in these spots – they look flat in a cell phone photo, but filled with depth of color and texture and shadow in real life. You should travel here and visit the park in person to truly appreciate its beauty. Because it’s the high desert and temperatures were still in the 80 to 85-degree range, I brought more than enough water with 2.5 liters in my Osprey Skimmer. I went through two delicious CLIF Nut Butter-Filled Bars, one Lemon Larabar, and a handful of Chimes Ginger Chews, and ultimately still wished I had packed more snacks or a more substantial lunch. After so many days of hiking, I was hungry. 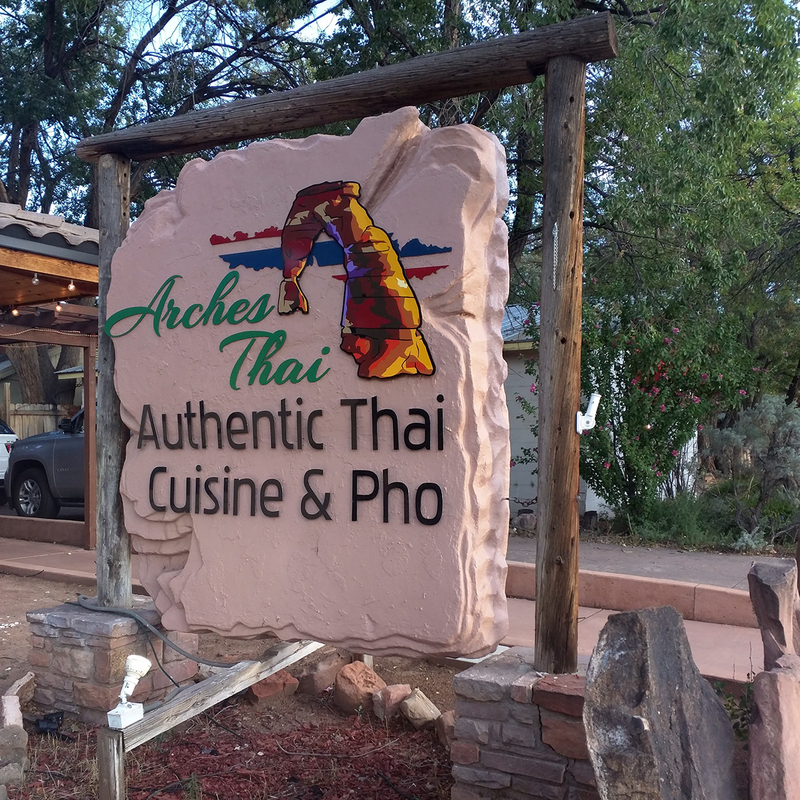 Arches Thai was one of the highly rated restaurants in Moab and you won’t hear any complaints from me. Service was a bit slow at first, but picked up rapidly. For an appetizer I started with their shrimp in a blanket, seasoned shrimp wrapped in rice paper and deep fried and served alongside a sweet and sour sauce. For my main course I got their ginger entree with tofu, which is stir-fried fresh ginger with bell peppers, mushrooms, carrots, onions, and green onions in a ginger sauce. It was sweet, spicy, filling, satisfying, but felt healthy-ish. 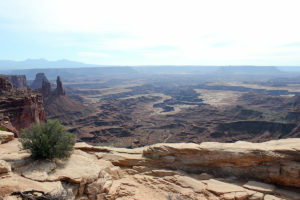 Day two in the Moab area was dedicated to Canyonlands National Park. 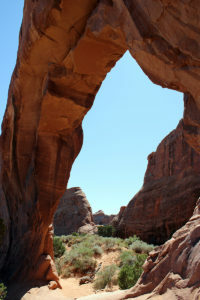 This park is much larger than Arches, divided into districts by the Green River and the Colorado River. 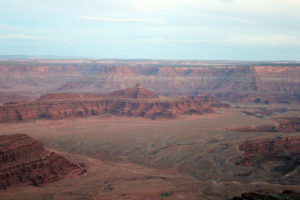 The four sections are Island in the Sky, Needles, The Maze, the rivers themselves, and a separated Horseshoe Canyon Unit. 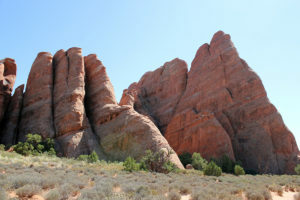 It is unrealistic to tackle more than one section in a day and some sections are reserved for advanced and experienced hikers and require special permits. I opted for the Island in the Sky district of the park. 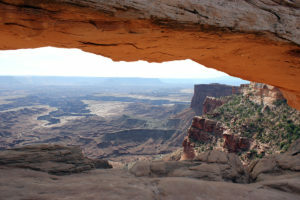 I liked Canyonlands National Park as a contrast to Arches National Park as it was a different variety of landscapes, rock formations and features of the terrain. 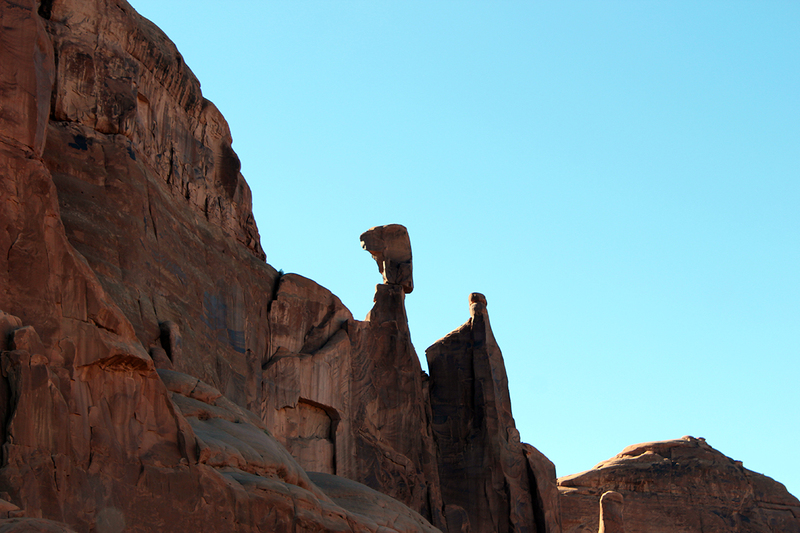 I started with Mesa Arch and Green River Overlook, then paused at Aztec Butte to hike around. 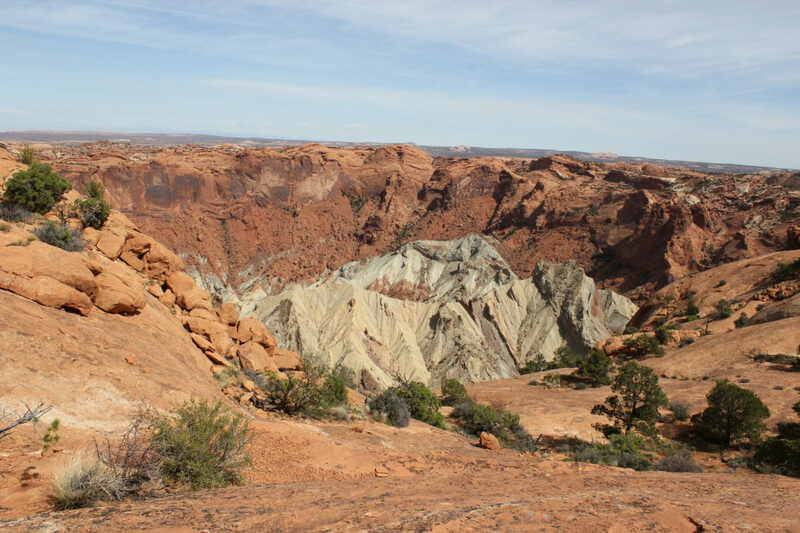 After that, I meandered to the Upheaval Dome area and checked out the different overlooks, as well as took the short jaunt to observe Whale Rock. 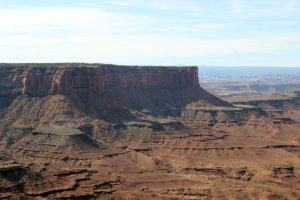 After that I change directions and headed toward Buck Canyon Overlook and the White Rim Overlook area. 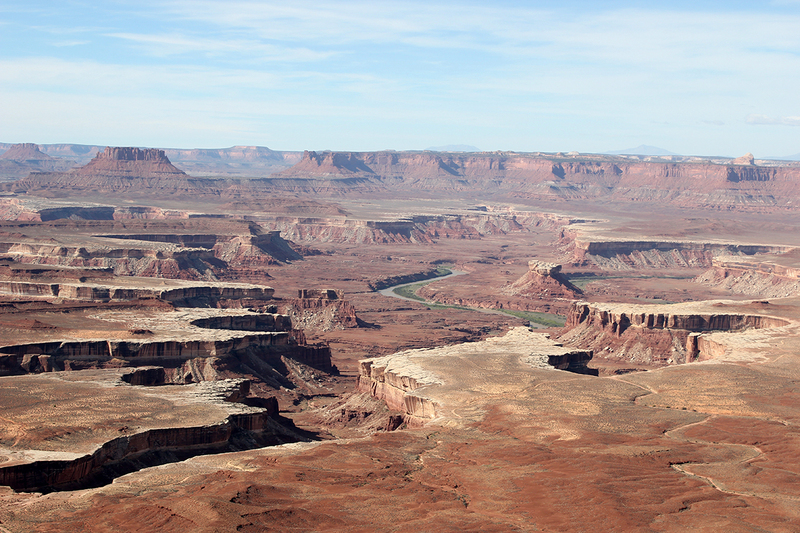 One of my favorite points of Canyonlands National Park was the grand finale for me – Grand View Point Overlook. This was a popular spot for tour groups to stop for lunch, but I made it a point to wander to the edge of the slick rock and take in the unbelievable panoramic views. I laid back, cross my feet and closed my eyes to bask in the sun for a while – and enjoyed the disorienting yet refreshing feeling of opening my eyes after dozing off to find myself on the edge of this vast expanse. 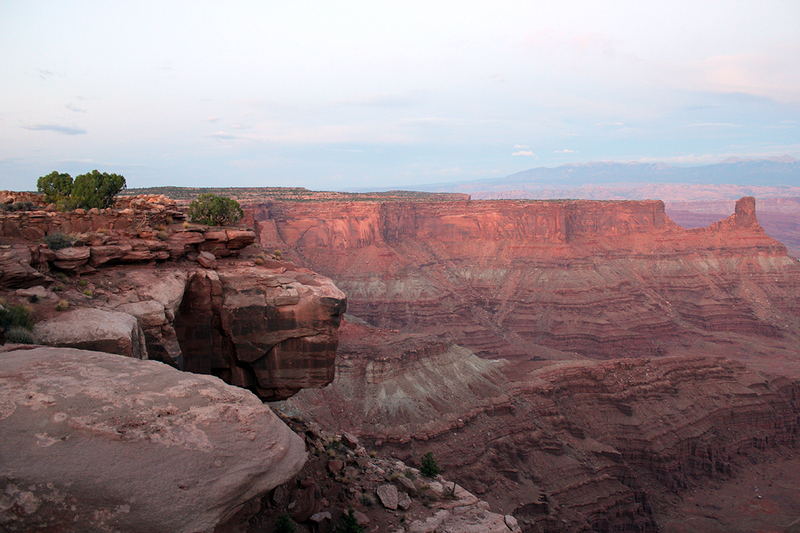 On my last night in Moab and my last major day of hiking on this big Utah trip, all I wanted was a burger and fries. After reading up on all the options, I landed at The Atomic. 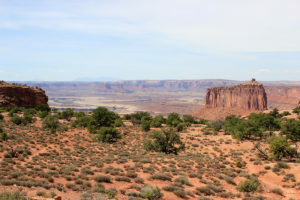 It’s on the outermost edge of the tiny main street in Moab, and I have to say I underestimated it at first when I pulled into the parking lot, but I was incredibly glad I went in. This burger and fries truly hit the spot. I ordered a vodka soda and got some unnecessary bread as a free starter, but ate every bite of it because I was apparently starving. Then on top of that, I ordered their Basic Burger with the veggie burger patty and a side of fries. It’s so interesting to me that their burgers come with lettuce, onion, pickle, and beets! Their servers also recommended highly their special house sauce, so I added that on and was so glad I did. The Atomic had a lovely patio and the weather was perfect to enjoy it. The staff was so friendly and helpful, all smiles and genuine people. 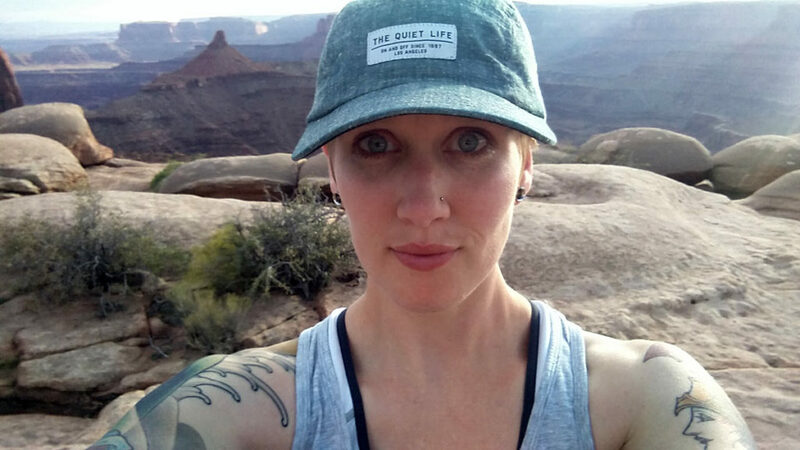 The most perfect moment of my evening here was reaching the last page in the book Wild by Cheryl Strayed – almost cathartic, and perfect timing to wind down this wonderful Utah hiking trip. I truly loved every page of this book and devoured it from cover to cover while on the road in Utah. 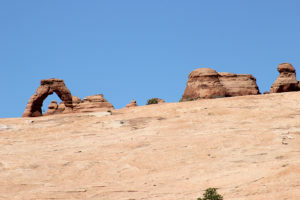 I had been so focused on the outdoor hiking adventures at the State and National Parks near Moab that I had largely neglected to hang out in the town itself. It’s a small town, so I figured I’d at least walk the main drag and check out what downtown Moab has to offer. 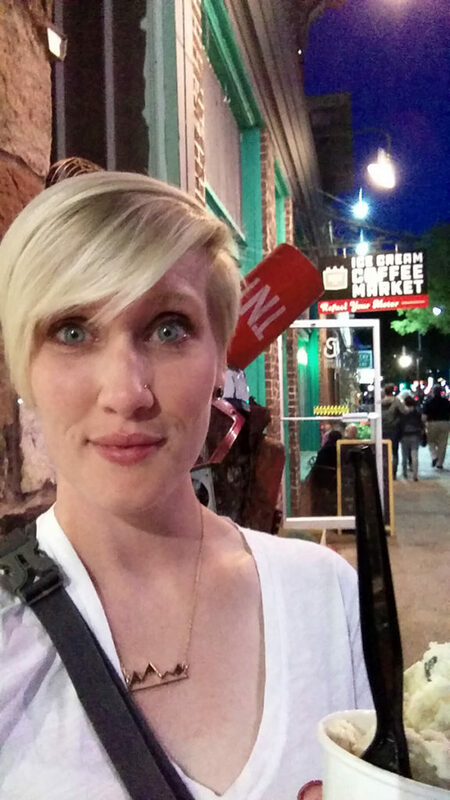 I popped into a number of locally owned shops and art galleries to get a feel for the area. 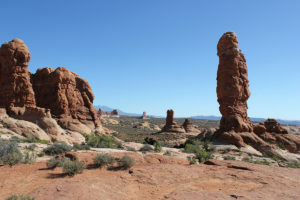 One helpful thing to note is that there is a handy tourism center in the downtown drag, Discover Moab, if you need maps, souvenirs or guidance on the area as you’re kicking off your trip. I have to draw special attention to the Moab Garage Company. I went in for the made-to-order Cryo ice cream, and left with some local wares. See the cool gold mountain necklace in the photo above? That little guy came from this adorable local boutique shop! I also ordered their cookie dough ice cream made in a single serving in a KitchenAid with liquid nitrogen before my eyes, and let me tell you… It. Was. De. Licious. SO GOOD. I wanted it to never end. Sweet, creamy, smooth, soft, bits of cookie dough crispness, fresh, oh my gosh I’m craving more right now. The last stop in Moab was a late breakfast at Love Muffin Cafe before I headed out of town back to Salt Lake City. The staff was very friendly, and I appreciated being able to sit in front of their big windows facing Main Street downtown so I could people watch. 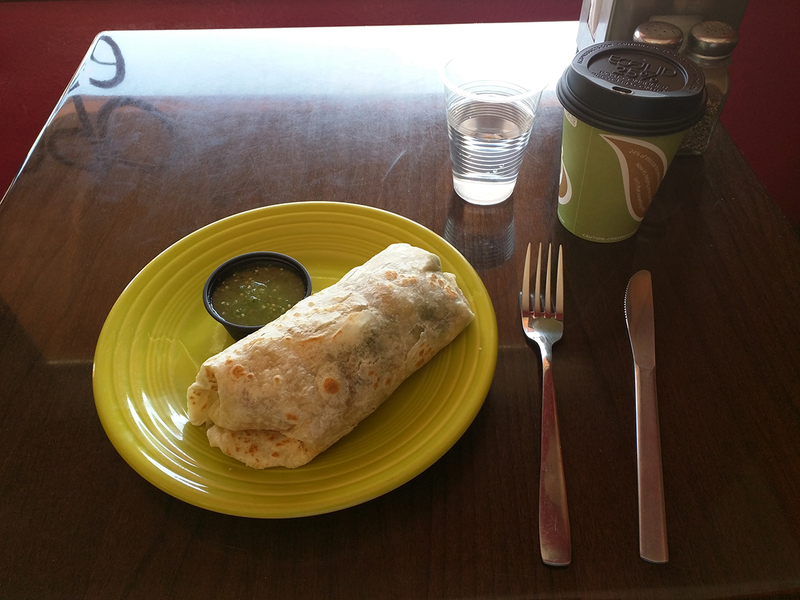 I ordered an almond milk latte (I’d say it was “just ok”) and their vegetarian Locals burrito with eggs, potatoes, spinach, onion, cheddar and salsa. It was massive and I didn’t even come close to finishing it, but pretty tasty. I was well-equipped, well-fed and well-caffeinated as I hit the road to head back to SLC and fly home.